After our wedding we will be staying in NYC as tourists for a week, checking off the bucket list for the city we love. Your gift will to toward activities such as a walk across the Brooklyn Bridge + water taxi ride back, a meal for two at Annita Lo's Annisa, a film at The Angelica and more. 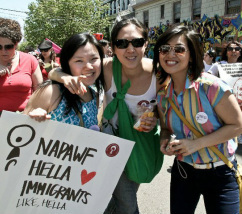 In lieu of a tradition gift, please consider making a donation to the National Asian Pacific American Women's Forum (NAPAWF), the only national, multi-issue Asian and Pacific Islander (API) women's organization in the U.S. NAPAWF's mission is to build a movement to advance social justice and human rights for API women and girls.